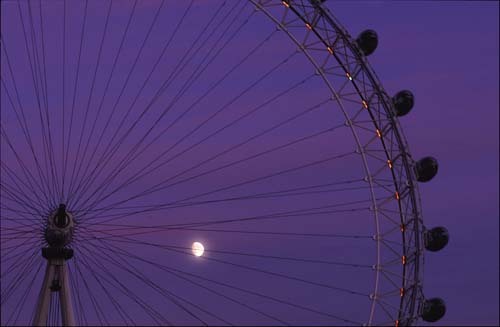 Ron and Maggie Tear Photography: London Eye moonlit. Taken on the Rememberance weekend,(Lord Mayors Parade), waiting for darkness to illuminate the eye.The moon appeared rising behind the eye, a perfect opputunity to make a juxtoposition.A fairly long exspsure requiered for this image. The London Eye, South Bank, London, UK.